A co-op board is able to conditionally approve a prospective purchaser of a co-op apartment, with full approval only given after the buyer has agreed to and satisfied certain requests made by the coop board. The most common conditional coop board approval requests are 1) the purchaser must deposit one or two years’ worth of maintenance payments into escrow and 2) the purchaser must have a third party guarantor for their maintenance payments. 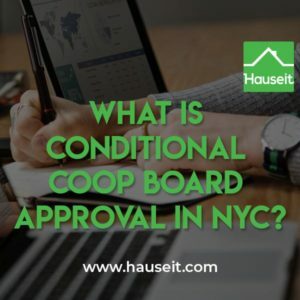 Why Do Coops Give Conditional Board Approvals? Do Coop Boards Have to Try to Approve Buyers? Can Buyers Back out Due to Conditional Coop Board Approval? Can Buyers Renegotiate Instead of Backing Out? How Long Do I Have to Keep Money in Escrow? Can Condo Boards Issue Conditional Approvals? Can Condo Boards Impose Escrow Conditions? Coops issue conditional board approvals primarily to prospective buyers who are on the cusp of meeting the coop’s financial requirements. These are buyers whom the board likes or sympathizes with, and would like to approve, but simply feel that the buyer’s finances are a bit shaky. As a result, the board seeks additional security that the buyer’s maintenance payments will actually be paid, even if the buyer faces unexpected financial distress down the road. No. Coop boards are not required to approve anyone, and can reject a buyer for any reason as long as it is not discriminatory. Furthermore, boards are not required to disclose a reason for rejection, so in practice coop boards can reject applicants for any reason whatsoever. It is completely voluntary for a co-op board to make an effort to approve a buyer who is on the cusp financially. This means that if a prospective buyer doesn’t meet coop financial requirements, the coop board is not even required to conduct a coop board interview. In fact, most applicants that are not financially qualified will be rejected by the board after a purchase application is submitted, but without a board interview notice ever being sent. However, savvy sellers’ attorneys who suspect that their coop boards have a habit of asking buyers to put money into escrow can negotiate language into the purchase contract stating that the buyer must agree to certain conditions, if required by the board, in advance. This language will usually be pretty specific, such as the buyer agreeing in advance to board requests for putting up to say 2 years of maintenance payments into escrow. No buyer would knowingly agree to a capricious coop board’s terms without limitation. Yes, if a purchase contract allows a buyer to cancel a contract because of a conditional approval situation, then the buyer can certainly renegotiate terms with the seller instead of walking away or agreeing to the terms. Keep in mind that the seller will have invested a lot of time, effort and money into the process by this point, and will be equally anxious to get a deal done. As a result, a buyer who doesn’t mind walking away can have a great deal of negotiating leverage over a desperate seller if this happens. How long you’ll have to hold money in escrow depends on a case by case and building by building basis. It’s common to see coop boards ask for one year’s worth or sometimes two years’ worth of maintenance payments to be held in escrow until the shareholder passes away or has sold the apartment. However, we’ve seen snobbish Park Avenue co-op boards ask prospective buyers to put as much as 10 years’ worth of monthly maintenance payments into escrow for a term of 5 years, a sum of over $350,000 dollars. No, condo boards have a right of first refusal, which is very different from a right of approval which coop boards have. A right of first refusal allows a condo building to purchase a condo unit for sale at the same price and terms as the prospective purchaser. If a condo building does not wish to do so, then the condo board is obligated to provide a waiver of its right of first refusal typically within 30 days. Since condominium units in New York City can easily be worth millions of dollars, it’s extremely rare for a condo board to exercise its right of first refusal. That’s because it’ll be extremely hard to cobble together that much cash from all the owners, and condo boards have a harder time getting loans vs coop corporations. Pro Tip: Condo boards have a harder time securing bank financing vs co-op corporations because a loan against a condominium corporation isn’t secured by real estate. The only security a condo board can offer is its power to levy common charges and special assessments against the owners. In contrast, a co-op corporation owns the entire building, and thus have significantly more collateral to offer in exchange for a loan. No, condo boards really only have two options when presented with a contract of sale. They can either issue the waiver of right of first refusal, or they can buy the apartment for sale. However, too often in NYC you’ll see condo boards who think they are coop boards and act accordingly. It’s shocking to see, but more and more condo buildings will have purchase applications that rival coop board packages in length and intrusiveness. You’ll even see condo board applications that ask for personal and professional references. Incredible, considering that condo boards don’t have a right to approve or deny an applicant. Very often you’ll see out of touch condo boards try to impose escrow conditions in return for the issuance of the waiver of the right of first refusal when the buyer is non U.S. based or a LLC. Condo boards may suspect that these types of buyers will be hard to track down for late common charges, and that the vehicle used to purchase the condo unit may simply be a shell meant to mask the true buyer. As a result, condo boards will very often ask the buyer to fund one or two years’ worth of common charges into escrow in return for issuing a waiver of their right of first refusal. When this happens, brokers and lawyers need to push back hard on managing agents and condo boards for trying to overreach. This is clearly not allowed, and inexperienced buyers need to be protected from such predations by overzealous condo boards.